Winter was fast approaching. Instincts were telling caterpillars, “Go and hide in cocoons”. It was time, caterpillars spun cocoons and rested. Otherwise, the crude jaws of winter cold would bite them to bits. It would be a cold blooded murder. A cocoon could prevent this disaster. It would enable a caterpillar change into butterfly. A crawling bug would become a flying insect. So, Skippy instead of spinning a cocoon cut two leaves and glued them on to his back. Now he was almost a butterfly. His friends out there were locked up in cocoons like prisoners. Skippy had a laugh at them. He looked at the sky. Skippy was thrilled, that the sky would be his domain. “No more crawling,” he murmured. Skippy looked at his wings and shouted, “Take off!”. But nothing happened. His wings were motionless. Why wouldn’t his wings flap? Before Skippy could figure out a reason, a sudden gush of wind swept him off the branch. Under normal circumstances, Skippy would have held himself firm with his clawed feet. But his leaf wings pulled him off his grip, because of wind force. 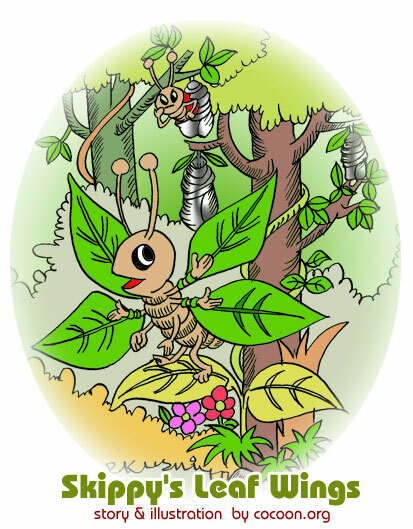 The swirly wind snipped the leaf wings and Skippy began to roll and fall down. He was sure to hit the ground any moment. But luck smiled on him. He fell on the shoulder of a little girl, Lezzy. Lizzy was not scared. She saw the caterpillar trying to stick on to her frock. She walked home quickly. She bent down and dropped the caterpillar on a soft bed of leaves in one corner of her room. It was a nursery for cocoons. Several cocoons were there safe and protected. Lizzy collected them when she walked into bushes nearby. She would pick up those cocoons which had fallen to the ground by chance. Left uncared for, the cocoons would have died and butterflies would never have emerged. Lizzy did this every winter, when caterpillars would spin cocoons and pupate. She would look for helpless cocoons, pick them up gently and bring them home. She would place them on a bed of leaves in one corner of her room. Left on the leaf bed untouched, most cocoons broke open in two or three weeks and released beautiful butterflies. Lizzy would watch the emergence of colors from cocoons in wonder; the butterflies would spread their wings and fly off through the open window on the other corner of her room. Lizzy made this a hobby. She was happy, she was helping cocoons. Skippy looked at the bed of leaves. The smell of cocoons revealed that they were all alive with pupae. Skippy thanked Lizzy, and quickly crawled under a leaf. He began to spin a cocoon. It would be foolish to disobey the laws of nature, he uttered to himself. But for Lizzy, Skippy would have never become a butterfly. He wished there were more children like Lizzy, who cared for butterflies.